Have you ever wondered why cats sleep so often? Are you worried your cat is sleeping too much? 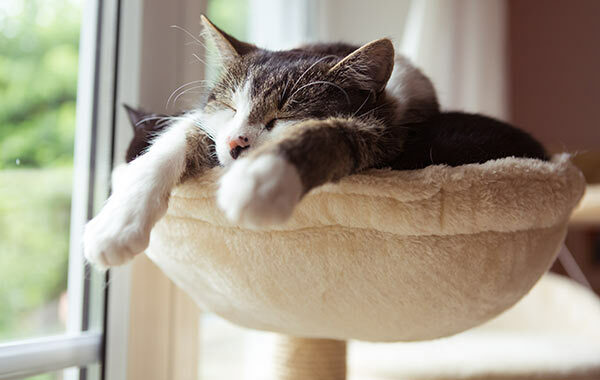 Read our advice on why our cats sleep so much. Cats spend about half of their day asleep, while we spend only about a third of our time with our eyes shut. The rest of the time they are grooming (five per cent), eating and drinking (three per cent), using the litter tray (less than one per cent) and generally active (including sitting and looking) 43 per cent of the time. Is it normal for my cat to sleep so much? Some people claim cats sleep even more, putting it at 15 hours a day. Estimates vary because it isn’t always easy for the scientists studying them to work out if the cats are genuinely asleep or just drowsing — or even pretending to sleep. Sometimes, stressed cats that cannot move away will be alert but will close their eyes hoping, perhaps, that if they can’t see us, we can’t see them. ‘Feigned sleep’ is often seen in nervous cats in rescue shelters. One reason why cats sleep so much is because they are carnivorous. Total carnivores like cats need to use a lot of energy to catch their prey, so, when they have had enough to eat, they save energy by sleeping. Herbivores (plant eaters) have to eat huge amounts of vegetation to get enough nourishment, so they have to spend more time awake and eating. Horses, for instance, sleep less than three hours a night. Omnivores, like humans, that eat both meat and plants, have a sleep pattern somewhere in between these two extremes. What influences the times when cats actually sleep? In nature, cats are animals that are active at dusk and night, so a cat that can go out at those times through the cat flap will sleep a lot during the day. Cats are flexible and can adapt to our timetable. Those that are not allowed out at night tend to sleep at night when we do, and then have a little time snoozing during the middle of the day. If we are around to play with them, they are less likely to sleep. Cats with arthritis may seem to sleep more, just because moving around is painful for them. Finally, cats sleep when they have nothing much else to do — no mice to catch, no humans to play with, no neighbouring gardens to patrol. If your healthy younger cat seems to sleep all day, maybe he’s just bored.